Last week saw the 700th review on SuperPhillip Central. Now, we make our way towards review #800! 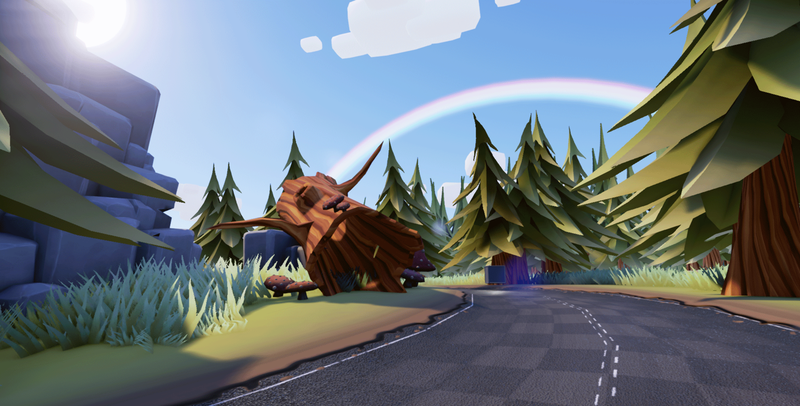 The first review on our march to that milestone is a colorful kart racer for the PlayStation 4 and Steam known as Bears Can't Drift!?. Here's the SuperPhillip Central review. Protip: The title of the game may or may not be truthful. Sure, you can always get a joy about racing real-life cars with pristine, realistic handling, but can you shoot a beehive out of the back of your Ferrari or BMW? I didn't think so! That's why I prefer the kart racer. Well, that and the genre's usual more newbie-friendly gameplay and creative track design! Bears Can't Drift!? came to my attention as one of the few kart racers available on the PlayStation 4 (it's also on Steam). With so few kart racing games on the platform, it was my hope that Strangely Named Studio's Bears Can't Drift!? would be a fun game. Was it? Yes, but just "bearly." The first thing you'll probably notice about Bears Can't Drift!? is the total lack of menus save for a pause menu, which doesn't do much explaining of the items in that menu. (And talk about how annoying it is to try to move the cursor to the restart race button.) Perhaps this was an effort to streamline the game, but it actually leaves for a lot of confusion. Sure, the beginning of the game seems simple enough to understand: You're thrust into a world with three paths-- one with a cute baby bear face, one with a normal bear face, and one with an angry bear face. It seems understandable that these are the various difficulties of Bears Can't Drift! ?, and successfully going down the path or road with the corresponding bear face gives you the corresponding difficulty. All right, that was easy enough to figure out. This is the road that enables Hard difficulty. Make it around this hairpin and jump the gap to enter Hard mode. However, then Bears Can't Drift!? gets little more confusing. 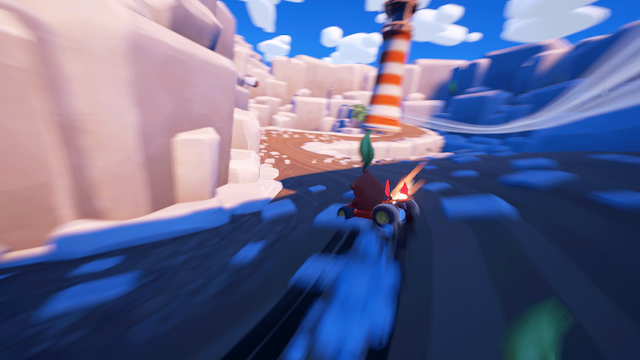 The game uses a hub world similar to Diddy Kong Racing and Crash Team Racing, but the developers have lost track of what made those hub worlds interesting and fun to explore. In Diddy Kong Racing, the hub world of Timber Island held many secrets in it that encouraged players to explore it. With Crash Team Racing, there wasn't much in the way of exploration to be had, so the only real purpose to them was to drive to each portal where a track was located. The thing about the Crash Team Racing's hub was that it was small, so going from track to track was easy peasy. Bears Can't Drift's three hubs, containing four themed tracks each, are much too big. For a game that wishes to streamline itself, here would have been an excellent part of the game to have smaller hubs or the choice of menus. As it is now, there's simply too much distance between race portals, and most of the time after you finish a race, you're kicked back into the hub. This usually means you're kicked to a place away from the portal to the race you just finished or lost at. Since portals contain three different modes for each race, which I'll go into later, generally when you finish one mode, you want to jump into the portal again to do the same mode. And since tracks don't even have names to them, it can be hard to remember what portal goes where. The hub worlds of the game connect the races together, but they also make for tedious travel. Furthermore, the lack of menus makes it so you have to drive up to each portal, pressing the Square button to change modes (something that, again, the game does not tell you), to see if you've completed that race in each mode. To beat a dead horse, the use of menus would have made it so you could easily get a recap of a given world, see which tracks are fully completed and if not, which modes need to be completed for said track, your best time trial for each track, and even which of the hidden collectible, the hats, have been acquired in each track. It all becomes a bit of a headache for a completionist like myself. As I touched upon earlier, there are three modes per track for players to participate in. The first is a simple race, where you compete against 11 AI bears in go-karts in a three-lap race to the finish. The second is a time trial, where you compete against the game's record times by trying to get the best lap time in a given race. Finally, Picnic is quite the creative battle mode, where you try to drive into various food like fruit and desserts, munching them up. As you eat more food, you grow in size, making it harder to see what's ahead of you. The first player to fill a food gauge wins the match. Of course, being a battle mode, other opponents can hit you, causing you to lose a significant portion of food in your bear's belly. Bears Can't Drift!? is obviously a misnomer of a name for the game, as these bears in the game certainly CAN drift, and they do it oh-so well. In fact, driving the karts in the game feels very responsive and tight. Drifting, as you'd probably guess, is a major component of Bears Can't Drift! ?, making you not only be able to cut around turns and corners well, but it also enables you to speed faster through the races than you would if you were driving without drifting. Thus, it's a good idea to try to drift as much as you can as you race. While driving does feel good, Bears Can't Drift!? is far from perfect when it comes to collision with other racers, objects, or the environments. Crashing into another racer results in both of you coming to an abrupt and unrealistic stop, while when colliding with some environmental obstacles, I got caught on the scenery, having to fumble with driving forward and in reverse to get loose. Sometimes these collision issues can cost you a race while other times they're just slight annoyances. Drift as much as you can to maintain your kart's fastest speed. 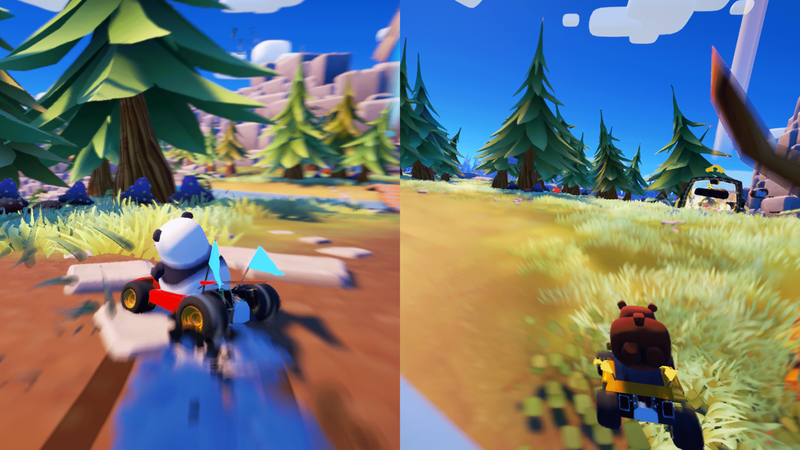 Like many games inspired by Mario Kart, Bears Can't Drift!? utilizes item-based combat within its racing. There are four main item pick-ups to be found: missiles, a bee that drops a hive that serves as this game's banana peel or oil slick, a defensive chameleon shield, and a owl-shaped boost. If you pick up two of the same item type in a row, you gain access to a powered up item, such as being able to launch five missiles in a row instead of just two, or hatching an egg that reveals a chicken that can squawk behind you to obstruct other racers. Another important part to a kart racer is having competently designed tracks, and Bears Can't Drift!? offers twelve unique tracks that range from quite fun to very confusing. For the latter, the game doesn't have a mini-map for tracks, nor does it even tell you when you're going in reverse. Some tracks have it so that it's very easy to get lost and not know where to go, even with the usually hard-to-see transparent overlay attempting to highlight the main path. While this isn't an issue in the forest races, it can get quite frustrating and bewildering in the ruins and arctic areas of the game. That said, Bears Can't Drift!? otherwise features some good ideas in its track design, such as clever shortcuts that can definitely shave off precious seconds in the time trial mode. Bears Can't Drift!? 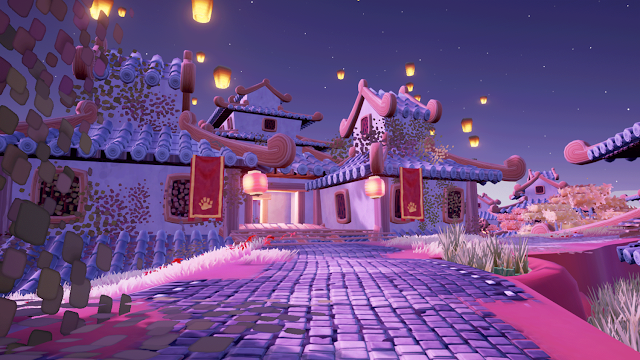 is quite a charming looking kart racer. The environments sometimes surprised me with how good they looked, notably in the ruins-themed races. The amount of detail in said environments is truly amazing. Meanwhile, the stars of the show, the bears, look a little less impressive, not really possessing much in the way of intricacies. The camerawork of Bears Can't Drift!? 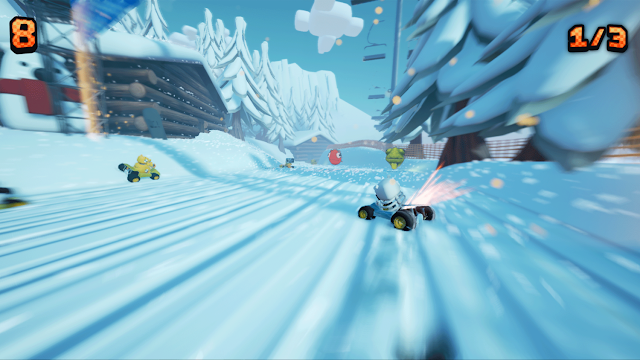 could be improved, including moments at the start of races where the camera clips through the racer behind you at the starting line, or allows you to see through the environment on some turns. Loading times are very small in length, making for retrying races or moving from hub to race or vice versa take little of your time. In this regard, Bears Can't Drift!? respects the player's time when the actual hub worlds don't. When it concerns the music, all of it is quite repetitive, and it doesn't help that two hub worlds' races share the same themes. Only the ruins races sport a unique racing theme. but you can't really be negative about its visuals. If you're looking for a kart racer on the PlayStation 4, then Bears Can't Drift!? has competent gameplay. However, its total lack of menus and explanations to its gameplay and modes make for a frustrating time more often than not. I don't see most young kids being able to understand what they're supposed to do for the most part due to this. Even something as supposedly simple as changing racers or adding players to the game (there is no online, only local multiplayer for four people) is a mystifying process without much in the way of guidance. Then, the collision issues with other bears and the environment also aggravate. However, if you don't think you'll mind these issues, then you'll certainly be able to grin and bear it. Review copy provided by Strangely Named Studio.